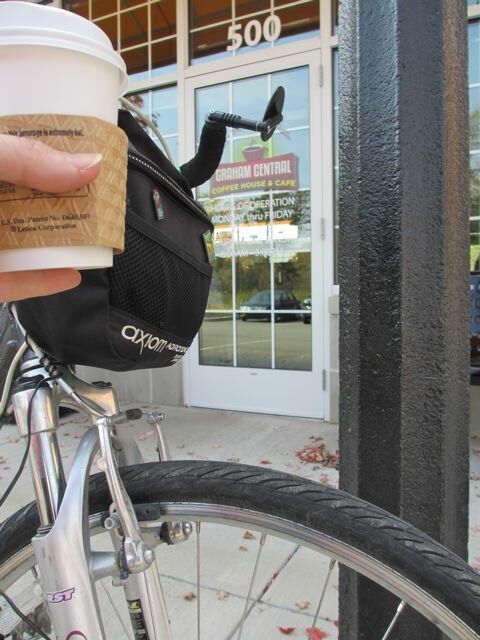 I couldn’t let a week go by without a post about coffeeneuring. 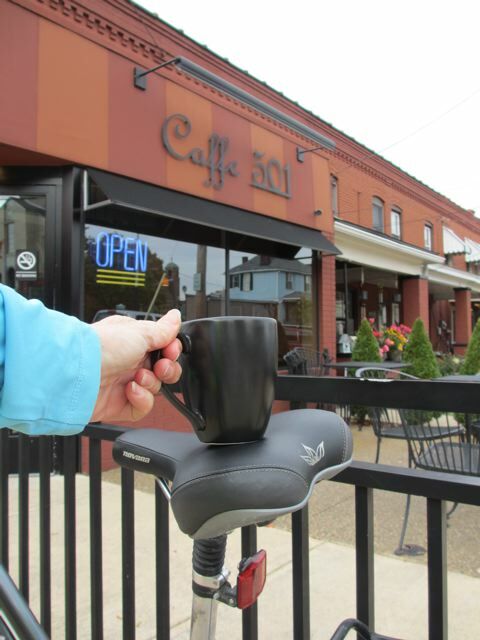 Today features a guest post from one of the first people to complete this year’s Coffeeneuring Challenge. S.R., a resident of Pittsburgh, Pennsylvania, completed the challenge this past weekend. Her coffeeneuring “events” took her to a variety of places (none of which I knew, as I’m quite unfamiliar with Pittsburgh). The narratives about S.R.’s trips feature a variety of beverages, in addition to many mural sightings, which she explains below. Events varied in length, from distances as short as 4 miles to as long as 48 miles. In addition, S.R. also met a yearly mileage goal en route to completing the challenge (well done!). You see? 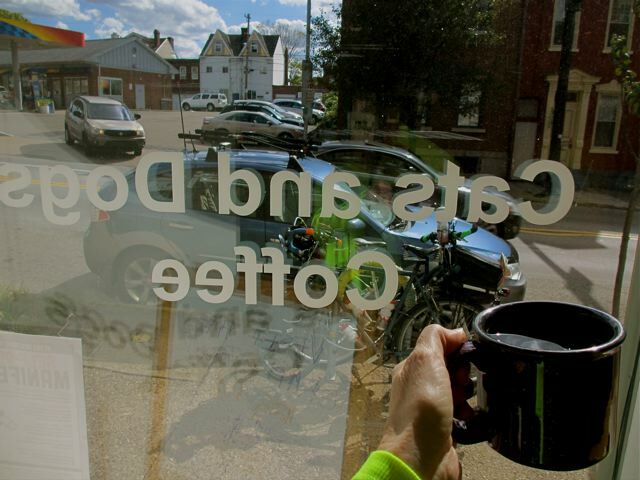 Good things happen when you’re coffeeneuring. First of all, may I say thank you for setting up this challenge. I’m not a coffee drinker and unless my friends want to stop (or the place has good bakery items or ice cream) I’m generally not that interested in coffee houses. I did, however, like having another destination to ride to. It was nice to hunt down the independent coffee shops in the area and explore them a bit. I actually found a few new teas and new places that I like. You might have noticed the mural theme in these rides. They actually started out in a similar vein – a destination for us. We found a list of almost three dozen murals around the city neighborhoods and started to ride to them rather than just riding around for mileage. We soon discovered that those were merely the proverbial tip of the iceberg and so far we’ve found, documented and photographed around 250 murals and pieces of public artwork. The little “something to ride to” project has taken on a life of it’s own. If you’re interested in seeing what we’ve compiled so far, here’s a link to the photos. Look in the narrative on that page and you’ll find a link to a spreadsheet with the information we have so far on each one. We’re still working on this. We realize that there are a lot of murals that we don’t know about yet. We’ve met or contacted several of the artists and eventually hope to put together a well organized project that other cyclists and walkers can use to plan their own rides/walks. Thanks again for the Coffeeneuring Challenge. This was a fun project. A raspberry/apple?/ tea, which was very, very good! We started the ride parking at Western Penitentiary and rode on the Heritage Trail system into and through the city of Pittsburgh to Oakland. 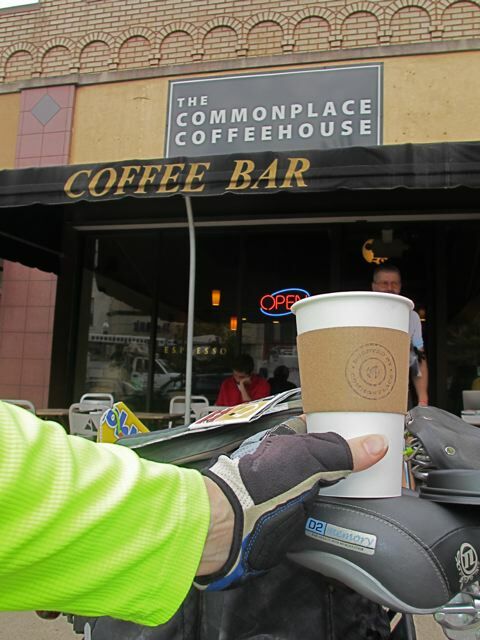 From there we rode out streets to Squirrel Hill, where we stopped for our coffee/tea break. Left Commonplace Coffeehouse and rode down to find some murals and public art in Swissvale and Braddock, then returned via the Rankin Bridge, Rt 837, and back to the trail system. We prolonged the ride a bit with an ice cream run back up the hill in Oakland in order to let me achieve my goal for the day – which was to go over 5,000 miles for the year. I really liked this tea. I plan to see if I can find the same blend (or a similar one) at a coffee/tea store in the Strip District next time I’m there. 41.57 miles for the day – 5002.1 for the year. 🙂 No, I didn’t plan on hitting that goal on the first day of this challenge. It was just a happy coincidence. I tried their Blood Orange tea, which I wasn’t thrilled with. This was a pretty short ride, but I had to get the lawn mowed. Started in Graham Park and rode around the ball fields before heading up to Graham Central. I’d never been in there before and was surprised to find the large selection of drinks and treats. They also serve breakfast. Who knew? I like the Blood Orange blend that I buy from a local tea store much better. I’ll have to try something else next time I stop here. A measly 4.1 miles, but better than nothing today. I enjoyed the perfect cool October day drink: hot spiced cider! Plus a cinnamon scone to complement it. Started at our usual trailhead at Western Penitentiary (AKA “The Bastille”). 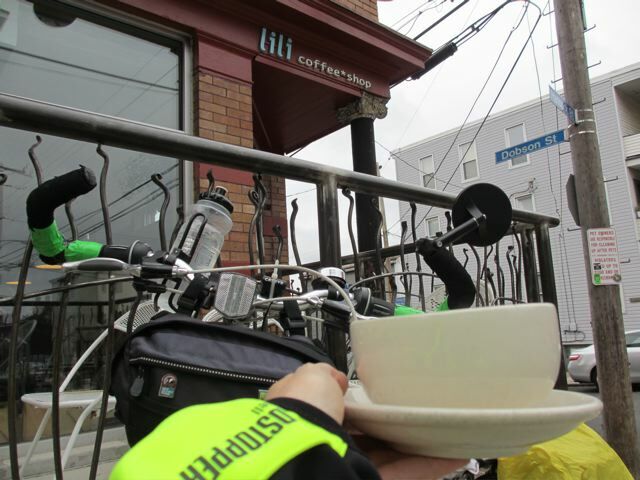 Rode trails to Oakland and took the streets out to Squirrel Hill where we stopped for the coffee/cider/sweets break. From there we continued out to East Pittsburgh on another mural hunt – capturing the elusive “Present Tense” mural on Bessimer Ave. Then reverse to the Rankin Bridge and joined the trail back to the Southside. A stop at Thick bikes to browse, then trails back to the cars. Although the morning started cold (30’s) it turned into a great afternoon for riding with mid 50’s and sunshine. Another good ride before the fall leaves are all gone. And that scone wasn’t bad either! We rode just over 40 miles today. Started the ride at the Bastille again in a cool, light drizzle. North shore trail to the 16th St Bridge. Stopped at the corner of Penn Ave for a segmented mural of a (presumably) 57 Chevy. Up Spring Way to avoid the rush hour traffic on the main roads and then 28th St, across the bridge over the busway and on up to explore the Polish Hill area of the city. This was new territory for us. No one had been in this neighborhood before. First we went in search of a Sprout Fund mural that isn’t actually a mural. It’s a sculpture attached to the wall of a building. Then off to find Lily Coffee Shop. This was a nice, little neighborhood shop. Fairly busy for being well off the beaten path and it seemed that most (if not all besides us) were from the neighborhood. 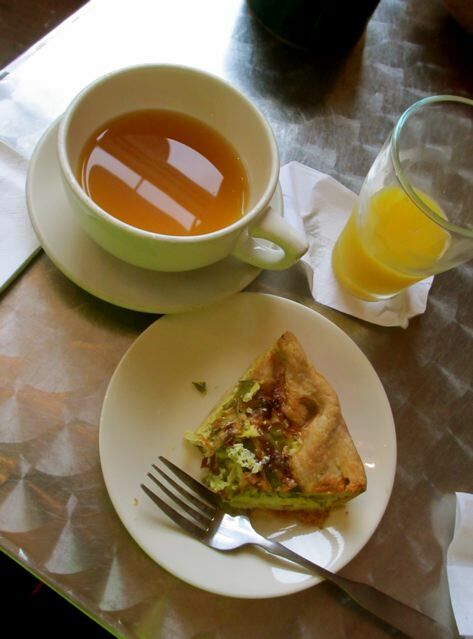 I had the orange spice tea and tried their green pepper and sweet onion quiche. Not bad. After that we backtracked down the hill to the Strip District and picked up the trail to the Point (Point State Park). Blvd of the Allies through the city to intercept the Jail Trail (ie the Elisa Furnace trail) out to the Hot Metal Bridge and then a stop at a favorite place – REI. From there it was eastbound on the trail (in off and on sunshine now) to see the groundbreaking ceremony for construction of the final section of the Great Allegheny Passage. Finally finishing the gap in the GAP. Munched on some very good cookies provided for the festivities while we heard the speeches and watched the ceremonial shoveling – this time with a front end loader instead of a shovel. Back through town and a stop at a stained glass studio in the West End to see if they’d let us go upstairs to view a mural they have on the second floor of the building. It’s barely visible from the West End bridge and there really isn’t any location where you can see much of it from. The folks there were very gracious and took us up onto the roof of the first floor so we could view the mural up close! Quite a work of art and a true labor of love for it’s creator. From there we took the West End bridge back to the Chateau Trail and a return to the cars. Another great day to ride with friends in the city. Still cool and a little drizzly when we made our stop here. This was a nice, neighborhood hang out and a good place to warm up at. Just under 26 miles total. Today I had every intention of heading out to a favorite stop along the Montour Trail. Normally I’ll park at the trailhead that’s near the 6 mile post and ride out to Farmhouse Coffee (at about 32.5 mile point). This morning the weather prediction was for rain in the afternoon. I just couldn’t motivate myself to possibly end up wet and still two hours from the car this late in the year. I don’t mind riding in the rain when it’s 80. It’s another thing when it’s closer to 50 though. I considered driving out a little farther so the ride would be less than the usual 52 miles to get to Farmhouse and back, but in the end I opted for something else. As much as I love Farmhouse – nice, neighborhood, trail-side stop with very good ice cream and baked goods – they don’t have much of a tea selection and I don’t do simulated cider (Would you believe from a mix!! No real apples involved!!). So I decided to try out someplace I’d never been to instead. That keeps with my theme so far anyway, since I had never tried any of the above places before either. Checked on-line for the hours of a coffee house in Ambridge that I used to pass on the way to work. Looked like they were still in business and should be open today. Now I had to consider this rain forecast again. I decided not to ride all the way from the house and drove to a park on the outskirts of the town of Ambridge. There was a mural I wanted to ride to a few miles east of there anyway, so I took this opportunity to do that as well. Of course, I ran into a typical Pittsburgh situation — a lack of street signs — and managed to get a bit lost on the way. As I was making my way back to a road that I knew would get me where I wanted to go an older gentleman stopped to ask me what I was inspecting. Excuse me? He must not see many cyclists in his neighborhood totally lit up with blinkies and neon reflective vests because he assumed I was inspecting a public works project or checking up on the garbage collection or something. Too funny. While he was telling me his life story (I had a hard time moving on here) he mentioned there was a coffee shop “just down at the bottom of the hill.” Since I had my plan I didn’t ask for more details. Eventually I was able to continue riding and worked my way over to the mural of dogs playing poker on the side of a building. Headed back to Ambridge and to my destination coffee house only to discover that they’re now closed on Thursday too! Found out they’re close to going out of business and only open three days a week. RATS. Back across town to hunt down this other coffee shop and luckily I found it. If not for the older gentlemen wanting to talk I would not have known there was another option for me at all today. Awesome. The owner of this cafe (Kathleen) was very nice and I enjoyed a good chat with her while I also enjoyed her homemade cranberry-orange-walnut biscotti with my tea. I’d like to stop back here again sometime. Good homemade biscotti and the tea was pretty good too. 10.7 dry miles on a beautiful fall day with the leaves at about peak color! Not a very long ride, but an enjoyable one. Started on the Chateau Trail segment and headed for Lawrenceville via the North Shore Trail and 40th Street Bridge. We knew of several murals in that area that we still needed to photograph including a fantastic glass mosaic at Prism Stained Glass. Afterward we rode up the hill through the cemetery and down Penn Ave to Cats and Dogs Coffee. They had some baked goods, but nothing that appealed to me so I just had the Orange-Spice tea. They sell Octavia tea and I’ve had their Winter Mint (Chocolate Mint) before and loved it. Unfortunately Cats and Dogs didn’t have that one so I had to settle for the orange-spice. We now had about three hours before we planned to join “Flock O Cycles” for an evening ride, so we decided we could make it out to Braddock to search for the elusive Maya Hayuk mural that we were unable to locate last week. This time we had a little more information on the general location and we were successful. Pretty cool mural. Departed Braddock via the Rankin Bridge, then cut down to the trail and eastbound to the Hot Metal Bridge, Jail Trail, Junction Hollow Trail and up the hill into Oakland. Grabbed a late lunch at my favorite fast food chain (Arby’s) and followed that with the very good homemade ice cream at Dave & Andy’s before we met with the Flock at Dippy (the large Diplodocus carnegii dinosaur statue in front of the Carnegie Library). This was our first ride with Flock and it was a very good experience. “Mr Marvelous” led us around the city towing a music system blasting out tunes as we rode (at least until the system had a breakdown). We got to meet several people that we’d only known from the Bike-Pgh message board. 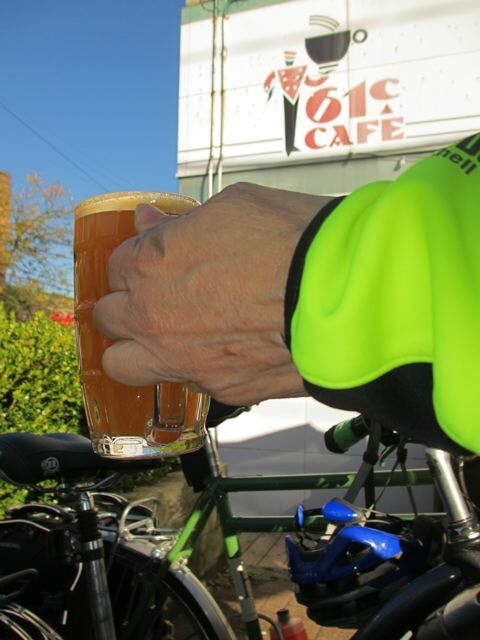 The ride lasted about 10-11 miles, ending at OTB Bicycle Cafe. We didn’t stick around. On the way back to the car it started to drizzle a bit, but we made it back dry. I discovered the value of having a second front light for the bike if I’m going to do more riding after dark. I neglected to charge mine that morning and the beam was so much less bright after using it in blink mode all day again. It was barely lighting the trail and it’s a good light. My friend, on the other hand, had a second light just for running when he gets caught in the dark. It was great! Started again at the trailhead by the Bastille. Rode into the city and to the location that always makes me smile (the waterfall tunnel at the Convention Center) to get a picture for the Bike-Pgh ‘Wheelset of Fortune’ game. Back to the Bastille to meet the guys at the agreed upon time. Chateau trail past the stadiums, Ft Duquesne bridge to the city. Went by the newest mural along Blvd of the Allies at Market Street. Originally, according to earlier press releases, this was supposed to be a mural to celebrate the Moving the Lives of Kids (MLK) organization’s tenth year of public art murals in the area, and their first one in the downtown section. Recently the city hosted the “One Young World” conference though, and somewhere along the line “they” decided to replace the original design with this mural to commemorate that event. Hmmm. Anyway, it was just recently completed so we went there to get a photo. Then one more downtown mural and back to the trail system – Strip District trail east to the Strip District of course. 21st Street Coffee and Tea (no longer at 21st Street, but a block away by 20th Street) for our drinks. I was hoping they’d have a bigger selection of teas, but it seemed relatively limited for a place that uses “and tea” in its name. I asked what they had that was nice and fruity and they recommended “King Crimson” herbal tea. It wasn’t bad. I was a bit surprised when they handed me a carafe and a glass for hot tea, though. Departed for another new mural at Sullivan Field in Bloomfield, but it was pretty much a non-mural mural. Just a little bit of a design on the side of a refreshment stand. We didn’t even stop let alone take a picture. Continued up through Bloomfield and Shadyside to Squirrel Hill and another coffee shop to meet with someone. We chose 61C to meet at because of our earlier coffeneuring stop there. We decided we really liked it. I tried one of their smoothies this time and it was terrific. Headed back to Oakland and down the hill to the Junction Hollow trail, across the Hot Metal Bridge into the Southside and down to Thick Bikes. One of the guys bought a cup holder; one discussed replacing the rear gears and chain on his; somehow I ended up discussing a new bike with them! This may turn out to have been an expensive stop if I follow up on the idea. After that we got back on the trails and returned to the cars. 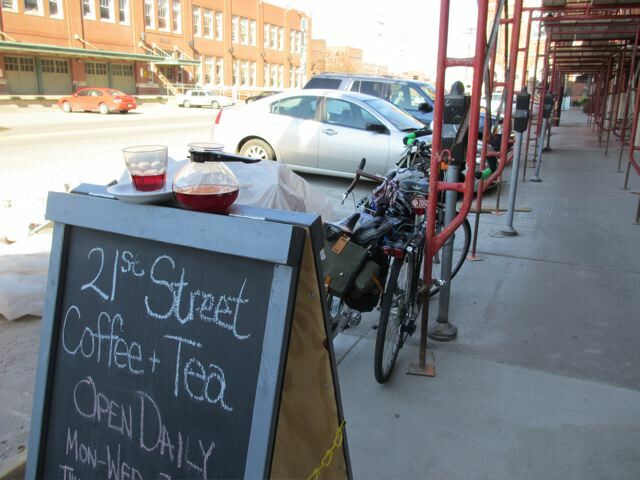 21st Street Coffee and Tea moved from 21st Street to Smallman near 20th Street. I like the new location, but it’s not really done yet. Construction going on all around them also. I told them they needed to look into some bike racks! They said they were actually working on it and might possibly have them inside — pretty cool. 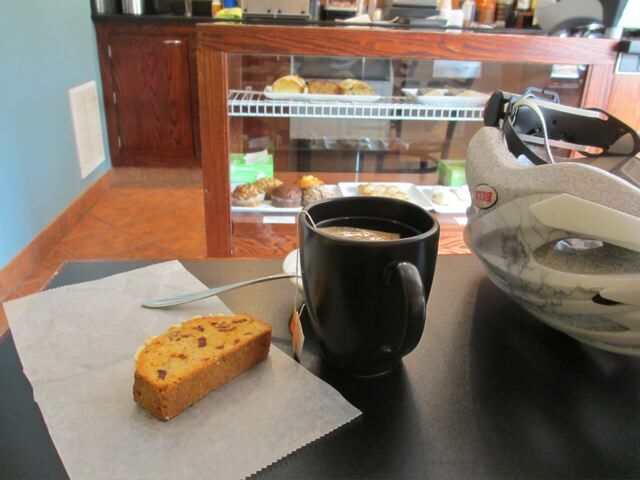 Thank you, S.R., for your lively write-ups, and for being part of this year’s Coffeeneuring Challenge. As I’ve been becoming more of a tea drinker over the past year, you’ve also given me some new ideas for teas to try. Thank you again! I had no idea that Pittsburgh had so many trails. Once the GAP is done it’s time for a 300 mile coffeneuring run! Great post. Really enjoyed reading about the Pittburgh cycling scene! I wish I liked coffee because then I’d join the coffeeneering joy 🙂 . Though I am going cycling tomorrow to join a friend for coffee. I will probably drink herbal tea … will that count? Yes, herbal tea would definitely count. 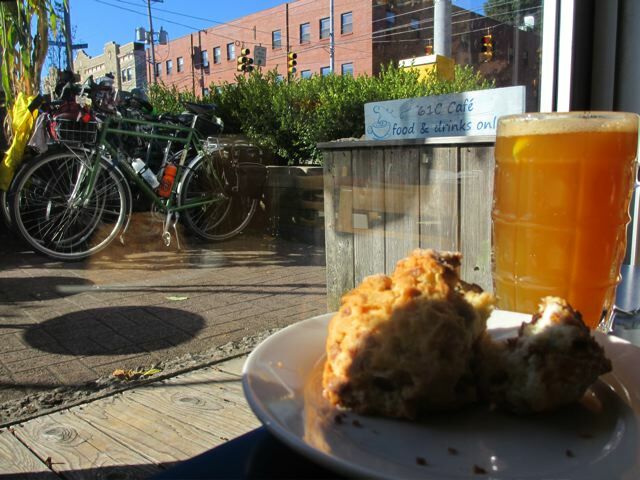 I love the posts, but tea on a coffeeneuring adventure? Ouch!